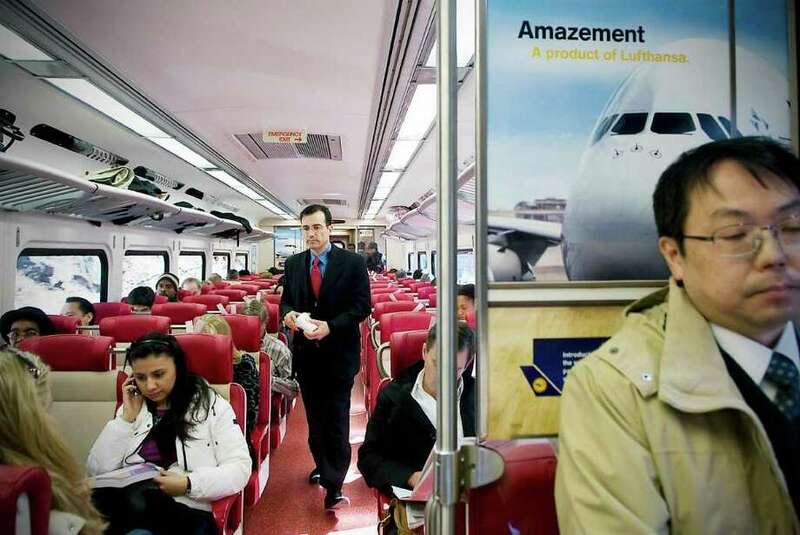 Passengers ride to Grand Central Station on the inaugural run of the new M-8 train from Stamford, Conn. on Tuesday March 1, 2011. The long-awaited debut of Metro-North's M-8 rail cars took place Tuesday morning in Stamford. The first of the six-car trains left Stamford at 10:30a.m. and made all local stops on its way to Grand Central Terminal, said Metro-North spokeswoman Marjorie Anders. 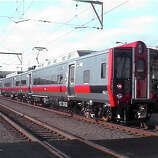 The train is the only M-8 that will immediately be in service on the New Haven Line, though a second six-car train is expected to arrive next month. Earlier this week, officials had expressed confidence the new trains would arrive soon. Tim McCarthy, Metro-North Railroad's senior vice president of capital programs, along with state Department of Transportation Commissioner Jeffrey Parker and other officials, said Monday that the first train of six M-8 cars would make its inaugural run carrying paying customers within weeks and expect the final testing hurdle -- a series of simulated passenger runs in which the cars must run without substantial error for 4,000 miles -- would be smooth. McCarthy said the 15-month testing process for the M-8s is about half a year shorter than testing to get the similarly designed M-7 cars into service in 2002. The M-7, considered a forerunner of the M-8, is used on Metro-North's Harlem and Hudson lines and the Long Island Rail Road. "We're oh-so-close to getting the M-8 cars in service," McCarthy said. "If we get them in service soon, it will actually be a quicker testing process than the M-7." Parker and McCarthy this week declined requests to discuss the testing status of the first set of M-8 cars. "We are hopeful the first M-8 cars can go into service very shortly -- perhaps within the next few weeks to a month," DOT spokesman Kevin Nursick said Thursday. Kawasaki's M-8 and the M-7, built by Canada's Bombardier Inc., include several similar features, including centralized computer control and on-board diagnostic systems, alternating current propulsion, automated on-board announcements and single-leaf rather than double-leaf side doors. Other shared features serve to make the cars less vulnerable to snow-related malfunctions with gaskets, circuit boards and other vital electronic components placed inside the compartment of the train, Anders said. The New Haven Line's fleet of 320 M-2, M-4 and M-6 cars has been crippled by age and outmoded design features this winter as wind-driven snow has fouled components located in plastic coffin boxes fastened beneath the train, Anders said. On Feb. 4, the railroad adopted a reduced schedule that cut service by 10 percent on the line. Last month, the MTA approved $12 million to extend the contract of the Louis T. Klauder & Associates engineering firm to oversee another seven months of testing for the M-8s to resolve software glitches and other problems delaying their debut. In late December, Metro-North Railroad President Howard Permut and Parker announced engineers were working to fix software problems causing electromagnetic interference from the M-8 propulsion systems that was throwing off trackside signal equipment . Other problems -- which Parker and McCarthy said are now resolved -- affected auxiliary power systems, which ensure the proper electrical current to run the cars is available, and automatic train control, which lets engineers know when it is safe to leave a station and how fast they can travel. Other production delays have contributed to the first M-8s being delivered in December 2009, nearly a year behind schedule, including a problem in 2008, when Kawasaki could not buy steel needed to build the cars. In spring 2010, former DOT Commissioner Joseph Marie acknowledged a delay in installing diagnostic software aboard the first M-8 cars held up testing of mechanical and computer components controlling speed, braking, restrooms, and doors on the cars. Connecticut Rail Commuter Council Chairman Jim Cameron and some New Haven Line commuters said dissatisfaction with the three-month delay in the cars' debut has been compounded by the breakdown of the New Haven fleet this winter and a lack of concrete detail from Metro-North and DOT officials about hurdles to introducing the new cars. At the same time, the council has given Metro-North credit for maintaining on-time service during a harsh winter of record snowfalls which has, at times, sidelined between one-third and one-half of the New Haven Line's electric fleet. Once the first M-8 cars go into service, Kawasaki has told Metro-North it could finish up to 12 new cars a month on a Lincoln, Neb., assembly line. Last week, the State Bond Commission approved a $81 million request from Gov. Dannel P. Malloy to act on the final 38-car option under an $866 million contract with Kawasaki to purchase 380 cars. Colleen Flanagan, a Malloy spokeswoman, said the governor is anxious to see the new cars enter service, and is relying on Metro-North and DOT reports that the debut is imminent. "The governor is confident in the reports he receives from the Department of Transportation," Flanagan said. "Beyond that, he is not an engineer. The DOT has told the governor that the new cars will be online before the end of March and he is looking forward to riding them when they are."